Hello! 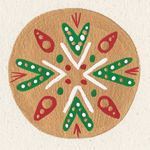 This year I painted over 200 Holiday Mandala Cards. If you are interested in buying some cards, I will be at The Quantum Coffee Holiday Pop-Up in Toronto on Friday December 18, 2015 from 11am-4pm with the last of the collection for sale. If you can't make it to that, send me an e-mail and I will add you to the mailing list and let you know next time a collection of cards is available. Thanks and Happy Holidays! Every card is a hand-painted one-of-a-kind original. They are painted on heavy-weight hemp card stock with gouache paint. 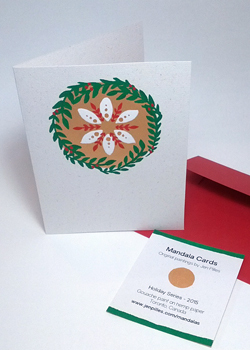 The cards are paired with a matching bright coloured envelope, and kept safe in 100% biodegradable packaging. They are 4" x 6" in size, blank inside, and stamped on the back with my logo and website. For more information on the mandalas and my process check out my Mandala Page or this interview I did. Thanks! Orders are now closed. But you can email me at jen@jenpilles.com to find out about future collections of Mandala Cards. I accept cash, money order, PayPal, e-transfer, Mastercard & Visa. It is my preference that payment is processed before I begin working on your order. If this is not possible let me know in your email and we can work something out (i.e. cash on delivery, partial payments etc). 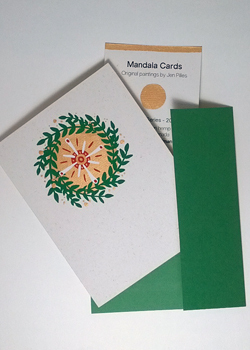 There are four styles of Mandala Cards to choose from this year. You can have all your cards in the same style, or mix and match. 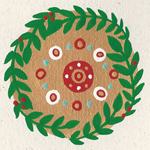 The choices are: Mandala, Wreath, Snowflake or Wreathed Mandala. See below for samples and descriptions of all the cards.